Sort through your turnip leaves, discarding any discolored leaves or leaves badly damaged by pests. Wash each leaf individually, watching out particularly for itty bitty spider webs and bits of soil. Grit in your greens might be fun to say, but it’s no fun in your mouth. Ask me how I know. Break off and discard any long tough stems that don’t have leaf tissue attached. Chop the leaves coarsely, set aside in a colander and allow any excess wash water to drain. Remove the rind from the salt-pork, if it has one. 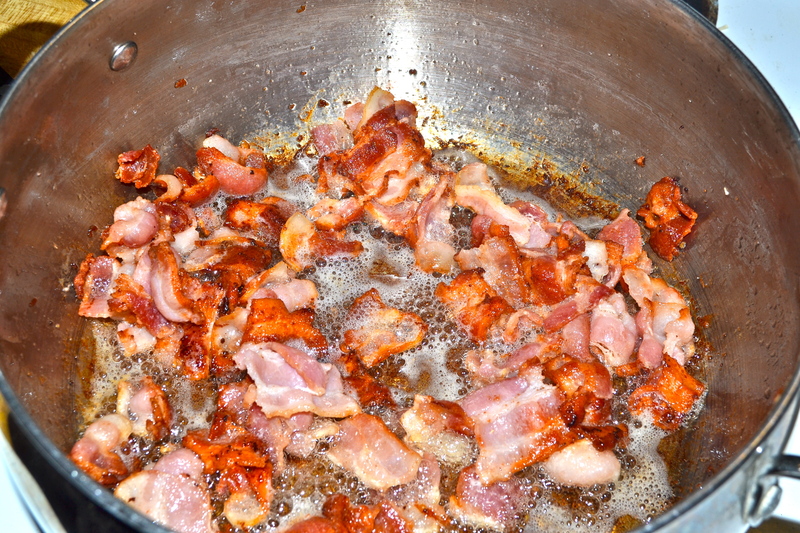 Soak the salt pork in water for about five minutes before rinsing it thoroughly in cold running water. I sent my hubby to the grocery store to get a piece of salt-pork for this recipe. Good Polish boy that he is, he can stuff the heck out of some cabbage leaves, but he’s a little scared of Soul Food. He sheepishly brought back a pound of bacon, Bless his soul, so I had to make do. FYI: you can make this with bacon just fine. Grandma Juanita sometimes did, though the finished dish is not as rich. If you are concerned about calories or cholesterol, you could even use turkey bacon, though that thought makes a crease appear between my eyebrows. Whichever: dice your bacon or salt-pork into cubes. Use a big pot or a dutch-oven to fry the meat until it is crisp and brown. Add the chopped onions and diced turnips to the pot. 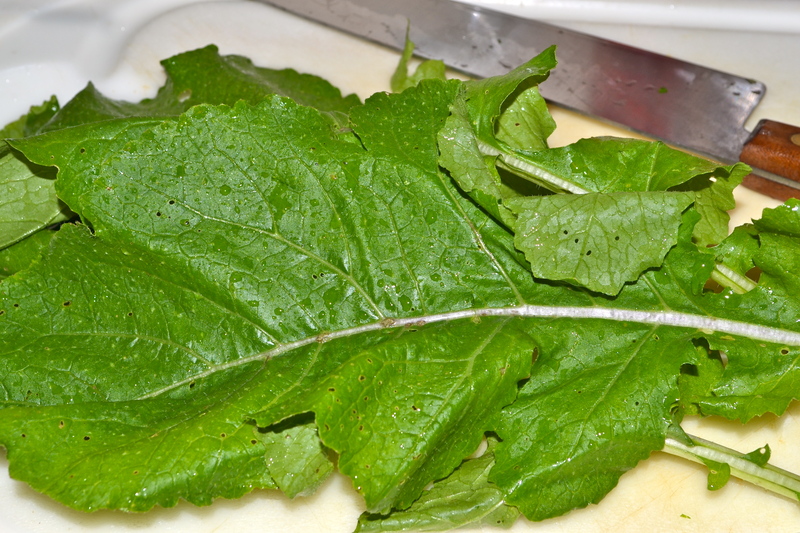 Begin to wilt your turnip greens in the pot by tossing in one or two good handfuls. Rely on the hot oil in the pot to wilt your greens. Do NOT cover the pot with a lid in order to “hurry” it along. As the leaves shrink, add more leaves by the fistful until the entire 4 pounds is in the pot. Wilt greens rapidly over high heat uncovered. Add two cups of water, the sugar, the ground pepper, and the red pepper flakes. Bring to a boil, then reduce heat to a low simmer and cover the pot. Simmer covered for a minimum of 45 minutes, stirring every once in a while. Now you will need to taste your pot likker (the liquid) to adjust the seasoning. Notice that this recipe doesn’t call for salt. The salt in this recipe comes from the salt-pork. If you forget to wash your salt pork, your pot likker will be too salty. You can correct for this by adding a little water, to taste. If you use bacon, your pot likker may not be salty enough. You can correct for this by adding a pinch of salt. If your turnip leaves are particularly mature and tough (or they grew in hot weather), your pot-likker may be quite bitter. You can adjust for this by adding just a touch more sugar to help modify the bitterness. Adjust the black and red pepper to suit your personal palette. You can make this dish as hot as you can stand it. Technically, you only need to simmer greens long enough for the turnips or potatoes to cook… but grandma let her’s simmer for at least an hour and a half. 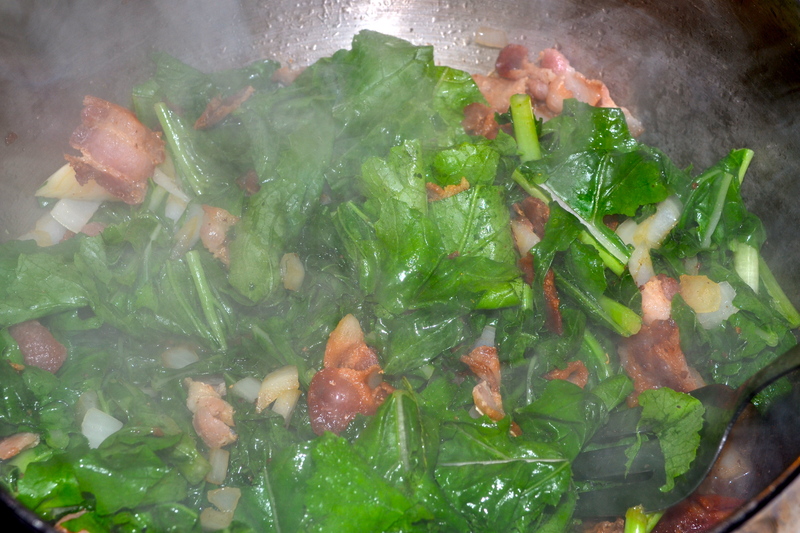 The longer you simmer them, the more tender leaves become, and the better the flavors meld. So let ‘em simmer longer, I say! Ladle into a shallow bowl. Drizzle with cider or malt vinegar. Make them extra pretty by garnishing them with pickled pearl onions, or with chopped garden tomatoes. In this photo, I used turnip kimchi. You can also add your favorite hot sauce as a condiment. Turnip greens make a great side dish, but they are also a meal in their own right. When served as the main meal, serve with any combination of side dishes like corn bread, stewed tomatoes, red beans and rice, creamed succotash, fried okra or… The options are endless. Enjoy!! This entry was posted in Recipes and tagged Garden, Gardening, Turnip greens, Vegetable, vegetable gardening, wilted greens recipes. As a vegetarian, I use a mix of olive oil and butter to wilt greens. And having grown up in New England, I’ve never cooked them to a fare-thee-well like this; a waste of good vitamins my elders would have said. I’ll have to try this method, though, if I can find good turnip greens at Shop ‘n’ Save. Your cooking is so pretty! This style of simmering greens for a long period of time is really a technique meant to make mature plant leaves that would otherwise be bitter and tough more tasty. 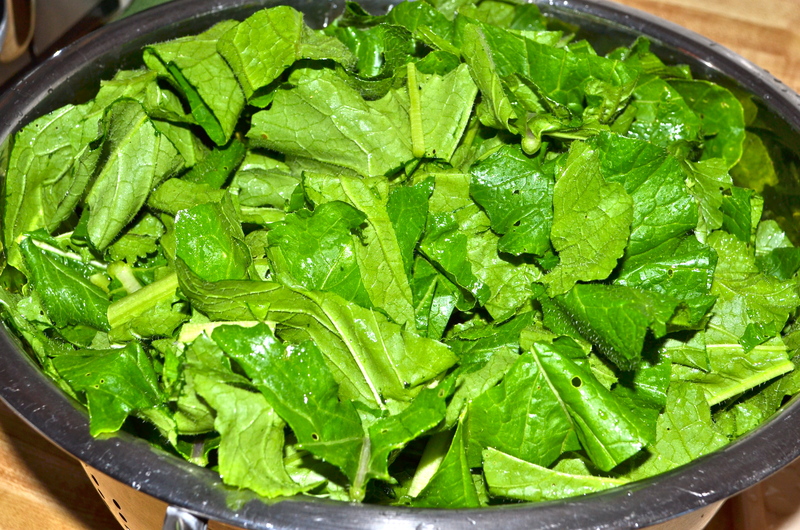 I never cook spring greens (which I harvest when they are young and tender) using this method. My other spring green wilting recipes are posted here as well. As for nutrition, this dish was my grandmother’s cure for anemia. Margaret: because I do a lot of fusing Japanese cuisine with my family traditional cooking, it occurs to me that you could very easily adapt this recipe using firm tofu in place of meat. You would fry your firm tofu in olive oil and onions, then wilt your greens right on top of it. Tofu would take up the flavor of the pot-likker very well, and is also a very good base to take up the flavor of cider vinegar or the various hot sauces. I might try it and see how it works out. Maybe you could try it, and let us know how it turns out. Thanks for getting me thinking along this line. I’m using about half my turnip crop for cut and come again young leaves. I’m delighted with your recipe for the big leaves when I pull the turnips. I should imagine the kitchen smells wonderful while this is cooking up. The smell is so yummy it is hard to make myself wait to let it simmer! My goodness that is quite a haul of veggies and greens. I hope to grow more root veggies next year. I will bookmark this recipe to try once i grow the greens or buy some. I can just smell that bacon. Give it a try! I’m sure your sweeto-haato could improve on the recipe with her own unique genius! AWESOME! I sent you an email and I would like to nominate you for the Versatile Blogger Award. Please let me know if you will accept so I can add you to the list of nominees. Good heavens! I only got this message today. If it isn’t too late, I am happy to accept such a nomination! AWESOME! I will add you to the list and let you know when I have it posted! Have to say I have not known exactly what to do with the prodigious crop of turnips we got from our CSA this year. Tried a variety of methods but none involved the greens. You tempt me to at least use up the tops while I let the roots sit in the fridge for a week or two as I avoid the issue. 😉 Thx for sharing!! !